Saddle: Highest point on the lowest Baltic to White Sea connection, 97 meter. This is not along the canal which has a high point of 102 meter. How to get there: There are two common starting points. One can drive up to Juvasshytta on a toll road or start from Spiterstulen in the valley Visdalen below. The Juvasshytta start involves the smallest vertical, about 600 m, but includes a crossing of the glacier Styggebreen. From Spiterstulen the vertical is more than 1000 m, but this trail is completely straightforward. In the summer season there will be guides leading inexperienced tourists across the glacier Styggebreen. Route description: The route from Juvasshytta proceeds along a well marked trail (the red letter capital T painted on rocks and small cairns) to the glacier Styggebreen. The crossing is quite easy, but proper equipment should be carried or one should team up with one of the guides across. On the other side, the trail gets a bit steeper climbing onto the ridge and eventually merging with the route from Spiterstulen. The trail continues to the summit where there is a small (tourist) hut selling snacks and souvenirs. 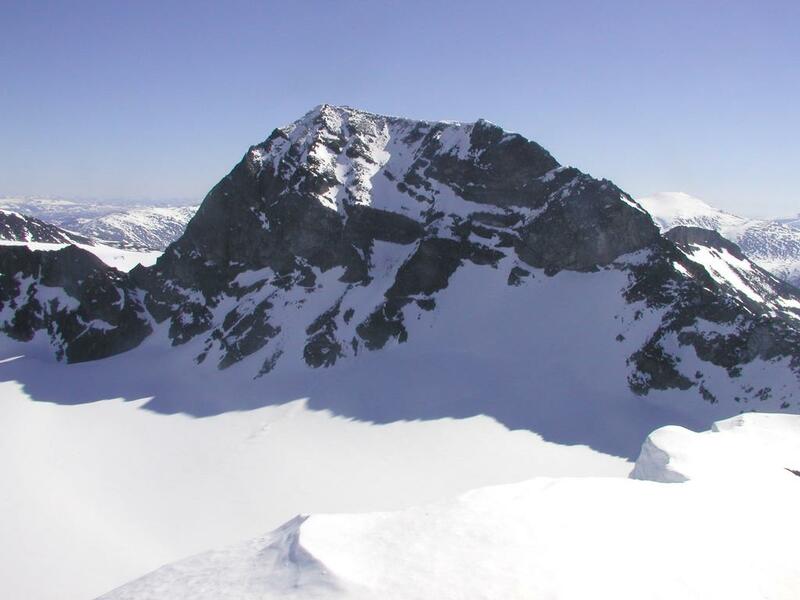 Comments: There is always something special about the highest point in any country, Galdhøpiggen being no exception. 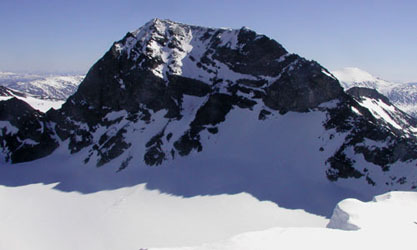 Galdhøpiggen as seen from the summit of Storgjuvtinden (2344m).